Tea tree oil, also known as Melaleuca oil, is an essential oil derived from the leaves of an Australian plant Melaleuca alternifolia through the method of steam distillation. The oil is clear to pale yellow in color and has a fresh, woody, camphoraceous odor. It is highly beneficial for health because it has several medicinal properties. For instance, it has antiseptic, antifungal, antibacterial, antiviral, expectorant, stimulant, and insecticide properties. Furthermore, it is usually considered safe as it is non irritant and non-toxic in nature. 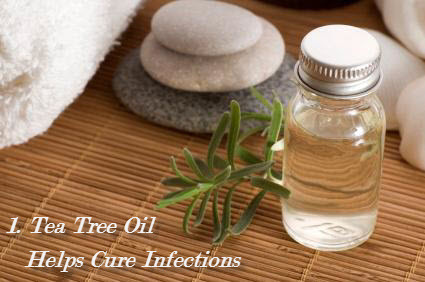 Tea tree oil is useful for fighting infections because it works as an immuno-stimulant. Thus, it increases the body’s ability to get rid of infections. Tea tree oil, in particular, is considered good for treating eczema, athlete’s foot, ringworm, boils, warts, etc. and relieves itching caused by these problems. Thus, when dealing with these infections you can either dilute tea tree oil in water, or mix about ten drops of this essential oil in carrier oil such as almond oil, olive oil, coconut oil, etc., and then apply on the affected area. It is suggested to avoid applying tea tree oil directly on sensitive skin, or else it may give rise to redness, itching and irritation. Besides, pure tea tree oil can be used to heal cold sores. You can even apply dilute tea tree oil (one part oil and one part water) on the affected area several times in a day. Plus, you may mix about six drops of tea tree oil in your bath water and soak in it for a while. In addition, it helps soften corns and calluses. Moreover, tea tree oil can be used for cuts, scrapes, burns, insect bites, scabies, minor wounds, ingrown hair, razor burns, skin tags, chicken pox, candida, ear infection, and so on. This oil is not meant to be ingested, but you can massage your gums with it or use tea tree oil toothpaste to cure mouth ulcers and gum infection. Alternatively, you can add three drops of tea tree oil a cup of warm water and gargle with this solution twice or thrice daily to get rid of gum inflammation, bad breath, laryngitis, etc. 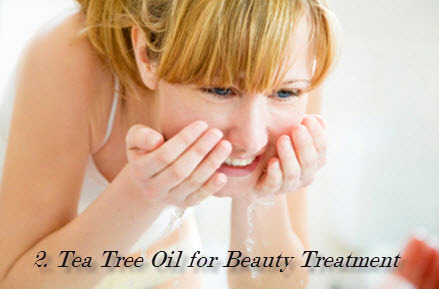 Tea tree essential oil works as a great beauty aid. It removes excess oil and fights off bacteria causing acne and pimples. In fact, it is considered as effective as benzoyl peroxide, which is often used for eliminating acne and blemishes. Hence, you can prepare a solution by mixing equal amounts of tea tree oil and water, and apply it regularly on your face two times in a day (morning and night) with the help of a cotton swab. Make sure you wash your face before putting tea tree oil. Before applying it on your face though, it is recommended to conduct a patch test on the inside of your forearm to check your sensitivity. This essential oil can be used for treating nail fungus, as well. 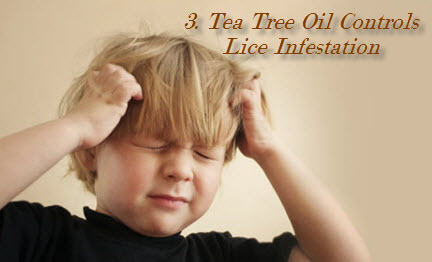 Tea tree oil is helpful in preventing and treating head lice. Therefore, you can simply mix it in your shampoo (put two drops of the oil per ounce of shampoo). Besides, you can 20 drops of tea tree oil in two ounces of carrier oil, apply this solution on your hair and leave for a few hours before shampooing. Alternatively, you can use a mixture of a pint of water and 25 drops of tea tree oil, three times in a day. These remedies, however, are not a substitute for combing. Hence, you will still have to comb out the lice and remove their eggs. Furthermore, you can combine two ounces of vodka, one ounce each of water and glycerin, half an ounce of tea tree oil, and soak your lice comb in this mixture to kill the lice and eggs. Moreover, in case you are bothered about lice in your clothes, you can put 12 drops of tree oil in your washer along with the detergent while washing your clothes. This is yet another benefit of using tea tree oil on your hair. You can mix this essential oil in your regular shampoo (one drop of tea tree oil per ounce of shampoo) or use a specific anti-dandruff shampoo containing 5% tea tree oil. Furthermore, you may apply a few drops of tea tree oil directly on your scalp before shampooing to cure scalp problems and get rid of dandruff. 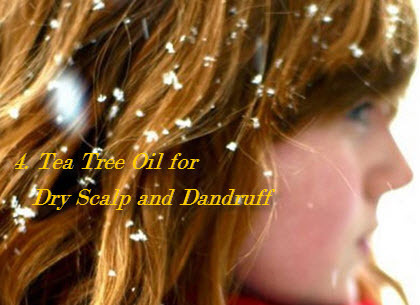 Besides, you can use a combination of tea tree oil and rosemary oil to treat dry, flaky scalp. You can also mix tea tree oil with water and spray it on your scalp throughout the week as a hair spritz. 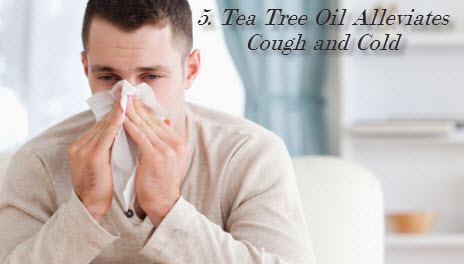 When dealing with sinusitis, bronchitis, cold, flu, sore throat, cough, whooping cough, asthma, and other respiratory ailments, you can add tea tree oil to a vaporizer to get rid of chest congestion. Plus, you can put several drops of tea tree oil in boiling water, cover your head with a paper towel, and inhale the steam. In addition, it can be mixed with some carrier oil and massaged on to the chest. 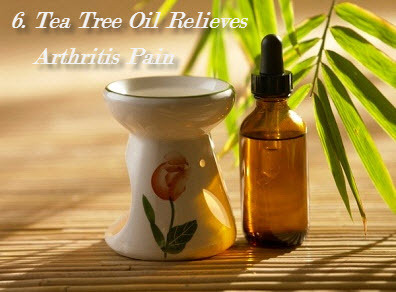 Tea tree oil has anti-inflammatory properties and flushes out uric acid build-up. Hence, it helps heal sore muscles, mild sprains, and arthritis pain by desensitizing irritated nerve endings. Moreover, it relieves wrist pain caused by carpal tunnel syndrome. Thus, you can massage the affected area with some carrier oil mixed with two drops of tea tree oil. If you are not sure where to get tea tree oil from, them you can purchase it from a drugstore or a health food store. It is usually available in the health and beauty section of the store. Though this oil is mostly safe, still it can cause allergic reactions in certain individuals, especially those who are allergic to eucalyptus, cloves, etc. I love this information, i am using tea tree oil right now in my shampoo for the dandruf and i love to see i can use it for multiple things thank you!